EXPRESS 2 – Free PSDs for cargo, logistics and freight business. In the previous article, I listed 9 best WordPress Beauty Spa Themes for beauty-related businessmen to promoting their websites. In this article, I will present 4 greatest trendy gym WordPress fitness themes so you can save time looking for one suitable fitness theme in the theme market. These 9 WordPress fitness themes are specialized in Gym, Fitness Clubs, Personal Trainers, Health Centers and other sport -related business. They are ideal for any kind of sport activity like Marathon event, Dance school, Boxing classes, Crossfit and Martial arts. They all come with a wealth of pre-defined options for a sport or health website to stand out among others. Their similar basic features include appealing clean simple look, Fully Responsive & Retina Ready and many built-in plugins included. Below I will give brief descriptions of these fitness themes and provide you with their live demos so you can check them and reach your final decision of purchase. Whistle is built with HTML5 & CSS3 with an awesome list of shortcodes and has compatibility with Cross-Browser. Whistle offers 2 unique homepage layouts, 3 unique header types, unlimited layout possibilities, dark & light color variants, multiple color skins, full width team with Carousel, course Carousel with Paypal integration, activities sticky scroll menu with easy NAV, event listing with filters, Masonry gallery with filters, Grid type gallery with filters, sign up form with great presentation, enquiry form with validation. Besides, Whistle comes with language support, Advanced Page Builder, Parallax Scrolling, WooCommerce, Slider Revolution, 700+ Google Fonts, Font Awesome Icons and Stroke Gap Icons. Check Live Demo for further information. GYM is focused on quality, usability and functional features like events, classes, schedule / timetable, opening hours, accessible from shortcodes and widgets. The theme contains blog page with comments, filterable portfolio with details page, responsive timetable page, classes based on accordion page and contact page with map of location and working contact form. This fitness theme is easy to use and customize. 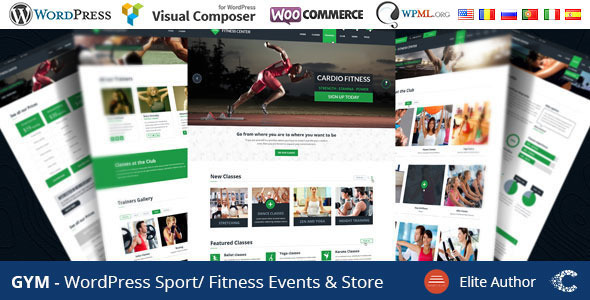 Gym is integrated with Visual Composer Plugins, WPML, Ultimate for Visual Composer, Slider for WordPress Revolutions and Page Builder. 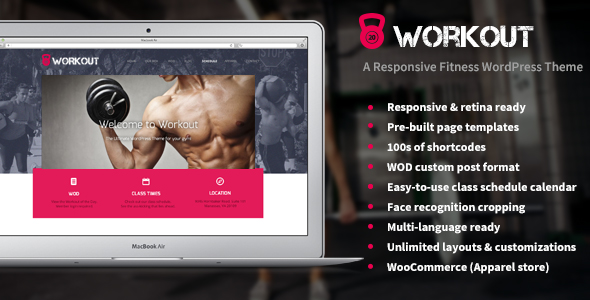 Besides, GYM works perfectly with all browsers and supports WooCommerce and Contact Form 7. In addition, GYM comes with Intuitive and Robust Admin Panel, Mega Menu Options, 8 Skins & 1 Click Skin Generator, Typography and Fonts Management. Moreover, it is favorable that Child Theme and 13 PSDs are included in this theme. Check Live Demo for more details. Workout is constituted by a unique collection of great features. Its custom post types include Quick Schedule Creation, Program List, Coach Page, Scrolling Testimonials, Special Banners, Beautiful Galleries and 100+ Shortcodes Manager. This fitness theme is characterized by unique features such as Fully Responsive, Contact Form 7 Support, Pre-built Page Templates, CSS3 Animations, WooCommerce Shop, Multiple Sliders and Footers, Infinite Customization Options and Internationalized/WPML Ready and much more. 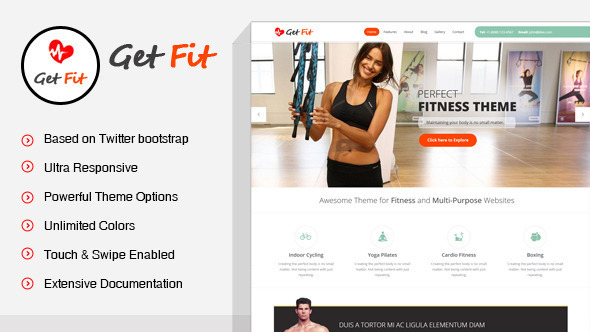 GetFit is very powerful yet easy to use and customize without coding skills. 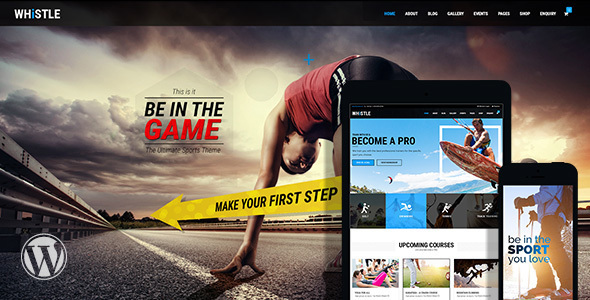 The Fitness WordPress theme is built on the Twitter Bootstrap Framework and jam-packed with a lot of features. 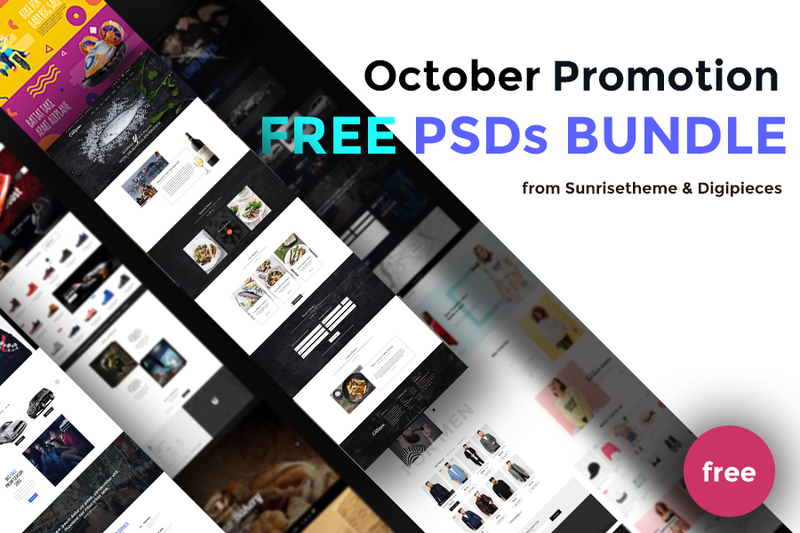 The theme offers 10 PSD Design Sources, Video Tutorials, Unlimited Color Styles, Powerful Theme Options. Besides, Extended Documentation, SEO Optimized, Multilingual Ready and Lifetime Updates are also included in the theme’s feature package. Take a look at GetFit’s Live Demo for more details. These 4 WordPress fitness themes are all ideal for a fitness and sports website. In case you cannot figure out which one is the most suitable out of four, I would recommend that GetFit is the top choice because it is sold at $49, the lowest price among all but still as great as the others. Despite being a student who specializes in Linguistics, I have an interest in WordPress and Open CMS. 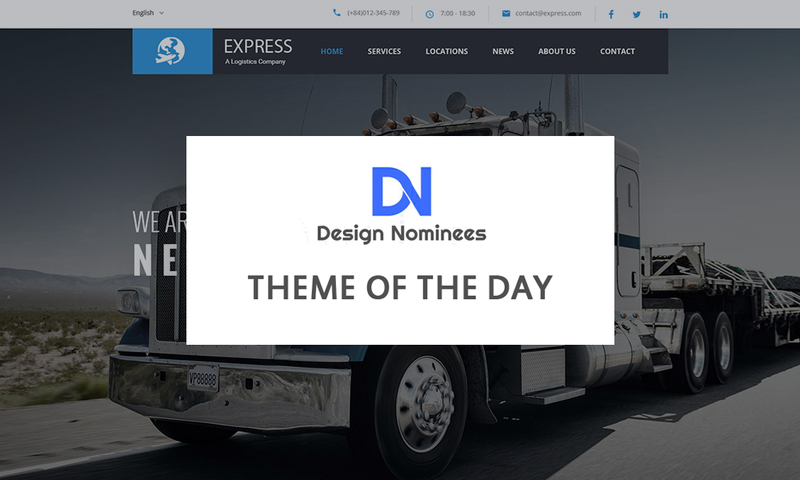 EXPRESS: Winner for Theme of the Day! 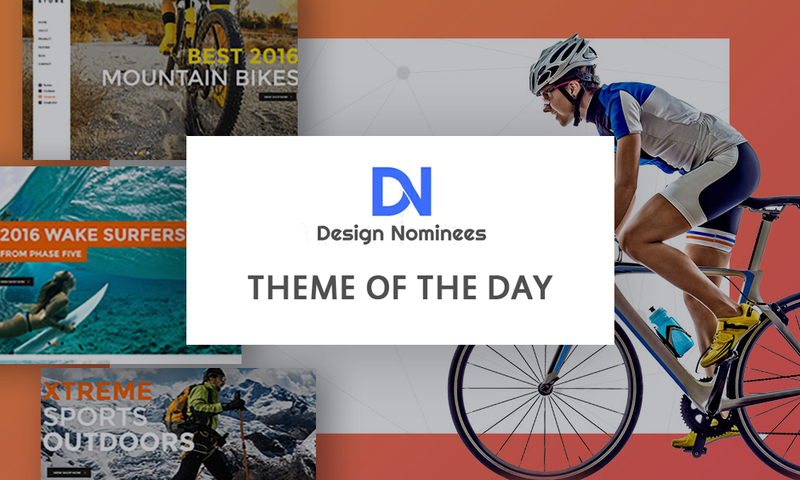 SK Store: Winner for Theme of the Day! 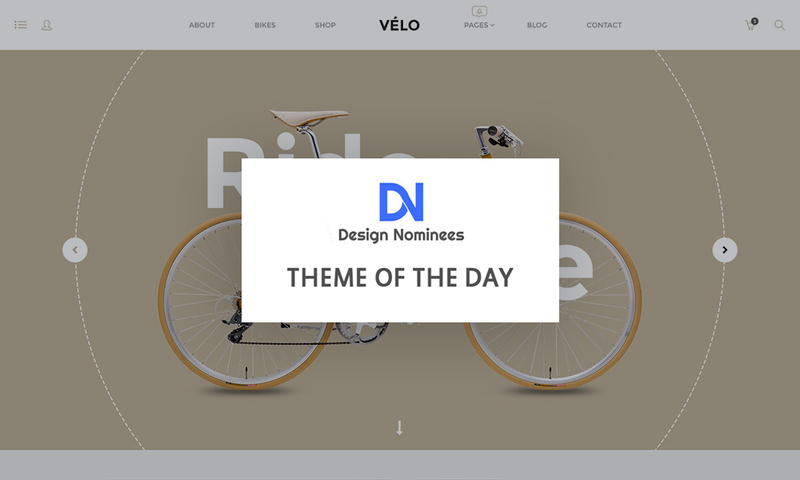 Velo: Winner for Theme of the Day!